A part of the painting Sa Pa in the Season of Clouds. 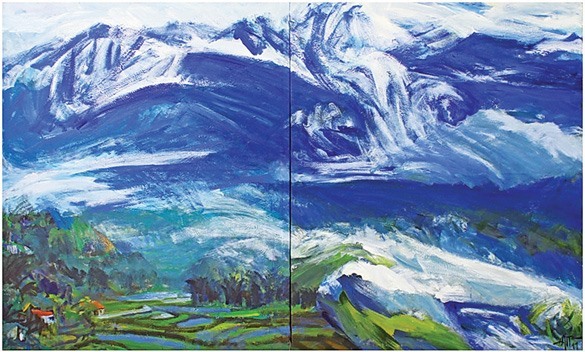 HÀ NỘI — The exhibition Four Seasons in Sa Pa, recently opened in Hà Nội, showcases 12 paintings by Đặng Tin Tưởng. Though the number of paintings is not large, I still spent hours contemplating them—they are too beautiful and lively. The paintings in large scale (1.2m to 8m long) captured the panoramic view of Sa Pa’s mountains, flowers, clouds and rice fields. Art critic Trang Thanh Hiền said people may feel dazed when they contemplate the paintings because the spectacular landscape of Sa Pa is right there, in front of their eyes. “Looking at the paintings, it’s like you are standing in front of the landscape,” said Hiền. Tưởng was well-known for working in lacquer and woodblock. But in the las 15 years, he has changed both his style of living and creating. He spends half the year living in Sa Pa. He also tries to expand his abilities with acrylic on canvas. “On the first day I came to Sa Pa with my friend, painter Trần Lưu Hậu, I didn’t know that I would become stuck to the land,” said Tưởng. Sa Pa in the season of flowers. For him, four seasons in Sa Pa are not spring, summer, fall and winter as usual; they are the seasons of pouring water onto terrace fields, clouds, flowers and ripening rice fields. “Those are the moments I was totally charmed and inspired by the landscape and people in Sa Pa,” he said. Tưởng said Sa Pa is always surprising to him with its magical, foggy, vaporous beauty. The dream land brings him different emotions and visions each time he comes. “Vast clouds flying in the sky at the dawn or sunset made me feel like I am in the wonderland,” he said. When art critic Phan Cẩm Thượng visited painter Tưởng, he realised that the painter was groping to find his way or pick up objects and sometimes missed them altogether due to his bad eyesight. “It sounds abnormal when an artist tries to paint as much as he can, more than ever in his life, at the edge of becoming blind,” he said. “It’s amazing that he can paint in this condition,” said Thượng. When Thượng wrote an essay about Tưởng, he titled it “Painting led by an inner spirit”. When an artist depicts nature, the best way to create is following the inner spirit, because nature is never understandable: just let the brush follow the perception. “It’s also the best way for a mostly blind artist to create,” said Thượng. That’s the reason why Tưởng doesn’t focus on details, he chooses to work on big canvas with big brushes. The beauty of nature now appears on the canvas as if it had been part of the artist’s life, Thượng remarked. Tưởng rented a flat at the most beautiful place in Sa Pa Town, where he has a panoramic view of the area. Sometimes, when he and his friends have lunch, clouds float through windows into the room, bringing cool, pure and fresh air. However, many buildings and hotels have been built in recent years. Sa Pa has changed drastically. In Tưởng’s eyes, it is not Sa Pa as it was on the first day he came. “I feel like Sa Pa is wriggling with economic and tourism development,” he said. Due to his eternal love for Sa Pa, he expressed the concern that in the future, the pristine beauty may be lost. Tưởng was born in 1945 in the northern province of Hải Dương. He has received many awards and exhibited artworks in Việt Nam as well as foreign countries such as Japan and the US.